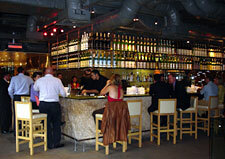 Zuma in London's Knightsbridge, offers one of London's most innovative and successful Japanese culinary experiences. Brainchild of Rainer Becker, who has since opened the award-winning Roka restaurant in Soho, the ethos behind Zuma is to deliver an authentic flavour of the east while respecting the traditions of the past. When Zuma decided to upgrade the sound system in their sophisticated sake bar and lounge, they turned to audio-visual installation specialists, Sound Division. Sound Division's David Graham explained that Zuma has a very stylish and discerning clientele, and in their sake bar, which is both chic and buzzing, Zuma's management felt that they needed an audio system to match. Sound Division completed a very successful audio installation in their sister restaurant, Roka, last year so it was only natural that the company asked for Sound Division's services here. To that end, Sound Division installed a total of five full range 300W JBL Control 29AV loudspeakers with QSC amplification. According to David Graham, the sound system is now in keeping with the quality of the surroundings. "Audio is an important part of most bar environments, and Zuma is no exception. The client was looking for high quality, intelligible audio that would help create that all-important ambience without drowning out conversation, and that's exactly what they've got."